A day after his victory in the New Hampshire primary, Bernie Sanders met Wednesday in Harlem, New York, with the Reverend Al Sharpton. NBC News reported Sanders did not make any public comments after leaving the morning meeting with Sharpton. Sharpton said they discussed issues vital to black Americans. Back in Vermont, many of Senator Sanders' constituents were "feeling the Bern" after his 22 point victory over Hillary Clinton, the former U.S. Secretary of State. "I really think that his strong win in New Hampshire will help him to raise more money," predicted Sanders supporter Jim Eaton. "I actually will give more money myself--a small amount--to help him win in other states." "I always felt that universal health care is important, and his ideas definitely appeal to me," Susanne London said of Sanders, noting his margin of victory over Clinton in New Hampshire did not surprise her. "I would be surprised if that happened in South Carolina." Nevada holds its caucus February 20, followed by a primary in South Carolina February 27. 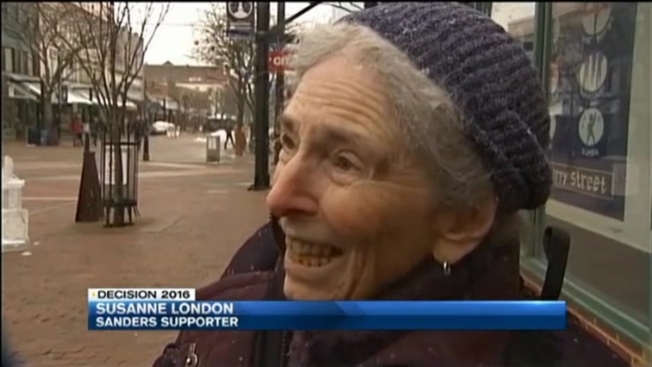 Sanders' win in New Hampshire even drew praise from someone who may not vote for him: Gov. Peter Shumlin, D-Vermont. Shumlin campaigned for Clinton in Iowa and New Hampshire, and has called her the candidate most qualified for the White House. "I'm proud of Bernie, and I think all Vermonters join me in being proud of Bernie," Shumlin said Wednesday, adding he believed months ago that Sanders could win New Hampshire. "We've got a long way to go. We're going to see some back-and-forth. So let's just all sit tight. It's a good process. Folks are showing up-- they're excited. This is a good debate for Democrats." Just since winning the Granite State, the Sanders campaign announced more than $5-million in mostly small contributions to help it continue pressing for what it has termed political and economic revolution.